On Wednesday April 27th, TCM held a press conference before the start of their classic film festival. The conference panel consisted of Charles Tabesh, senior VP of programming, Jennifer Dorian, Ben Mankiewicz, host of TCM and Genevieve McGillicuddy, VP of brand activations and partnerships and festival director. Tabesh and McGillicuddy oversee the logistics of the festival and Mankiewicz is taking a bigger role this year, as he did last year, in the absence of Robert Osborne. He'll be conducting most of the big interviews that will happen during the festival. Mankiewicz, who is introducing the opening night film All the President's Men (1976), gets emotional every time he sees the movie because of the connection to his father. NY Post's Lou Lumenick has a great article with more details. According to McGillicuddy the projected number of attendees this year is 26,000 which includes passholders and standby attendees. I didn't realize it was that many people! TCM is launching FilmStruck (think of it like "awestruck"), a new subscription service. They've teamed up with Criterion, who will end their current partnership with Hulu, and together will be curating arthouse films, indie and cult classics and other more obscure films. 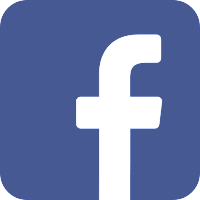 Jennifer Dorian says this fills a need in the marketplace. It's important to note that this is not a standalone streaming TCM service. While it was not said at the conference, TCM's relationships with cable TV companies most likely prevents them from having such a service. Read Will McKinley's post for more details about FilmStruck. TCM is launching TCM Backlot, an official fan club. 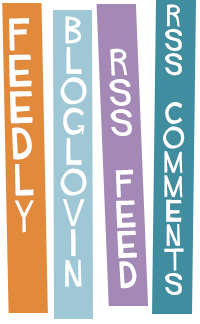 The membership costs $87 a year and comes with a variety of perks. 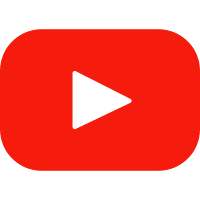 There will be meet-ups across the country, exclusive content for subscribers, etc. 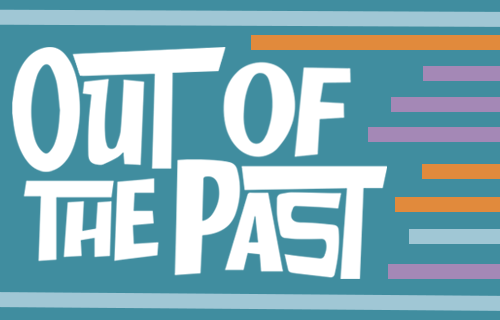 The Backlot will give members a behind-the-scenes look at TCM and an opportunity to share feedback. Dorian says "early members will help us build the club of our dreams." 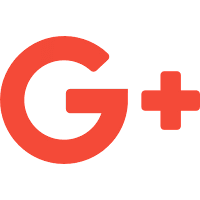 I have a membership and will be following up with my thoughts on this blog. Based off feedback, The Manchurian Candidate (1962) will be the most sought after event at the festival. Tabesh says Angela Lansbury, who will be at the screening, is always a big hit with TCM fans. McGillicuddy says they've been really working hard on curating Club TCM events and she's proud of the offerings this year. On sought after guests, Tabesh says Olivia de Havilland almost made it to the festival one year and their number one pick Doris Day is unlikely to ever be a guest. McGillicuddy said Sidney Poitier is someone they've tried to get multiple times are still hopeful he will come. Tabesh says Barbra Streisand is interested but hasn't been able to make it work with her schedule. Ben Mankiewicz said "The success that the previous six festivals have had has unquestionably played a role in smoothing it over for some people because their friends and colleagues and other big stars have told them this is a worthwhile thing..." Having several successful festivals under their belt has opened up opportunities to feature other special guests. For example, this was key in getting Faye Dunaway to attend this year. Although it was not said during the conference, I do believe having Sophia Loren last year really made a difference. I can imagine that opened an opportunity to feature Gina Lollobrigida. Spotlight and Essentials passes sold out in 14 minutes. They won't be expanding the festival to add more venues, screenings and days. They want to keep the intimate atmosphere of the festival. Tabesh says the industry is moving towards digital. Access to 35mm prints and the ability to show them becomes more and more restricted over time. 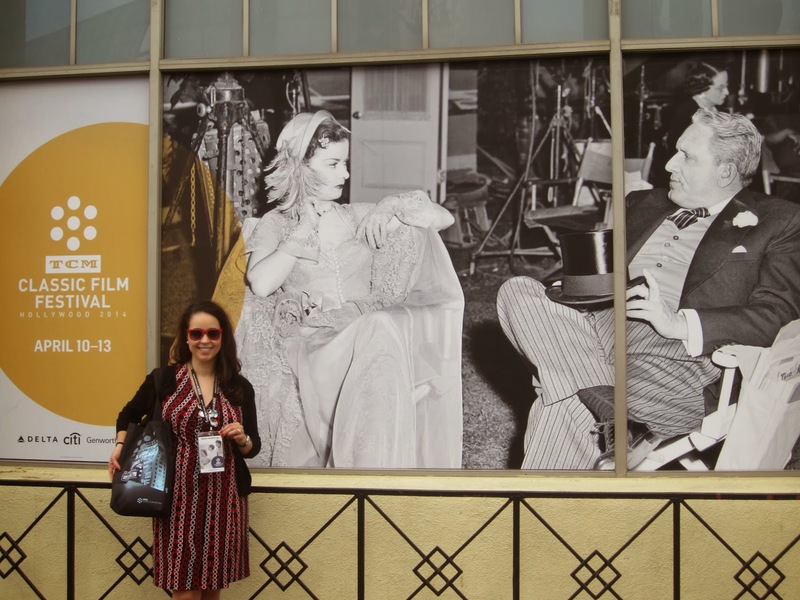 It’s that time of year again when classic film fans from all over the world flock to Hollywood to enjoy a weekend packed with once-in-a-lifetime experiences. The TCM Classic Film Festival is something I look forward to all year round. When you go to this festival you feel like you’re part of something important. You develop a deeper and richer connection with the past while being part of history in the making. This will be my fourth time attending the festival and I’ll be covering it once again as a member of the media. I’m very grateful to TCM for the opportunity to once again be a part of the fantastic team of individuals who painstakingly and lovingly capture and share each of every moment of the festival. It is truly an honor. Now that the full festival schedule is posted I can share my top picks with you (fun fact: I was the first to tweet about it). It was much easier in 2015 to put together a schedule. This year there were some major conflicts and some difficult decisions had to be made. Here are my selections. I’ve included a bonus video of me discussing my top five picks. 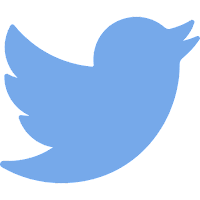 TCM Press Conference – I’ll be live tweeting and providing full coverage on this press conference which will include Ben Mankiewicz, Charles Tabesh, Genevieve McGillicuddy and Jennifer Dorian. Sadly no Robert Osborne this year. He was the highlight of the first two press conferences I attended. Red Carpet for All the President’s Men (1976) Opening Night Gala – I was a spectator for last year’s Red Carpet and had a blast. I hope this year I can do more extensive coverage. Stay tuned! Guess Who’s Coming to Dinner (1967) or Los Tallos Amargos (1956) – It’s a toss up between these two. Katharine Houghton will be at the Guess Who’s Coming To Dinner screening and it would be great to hear her discuss the film. But it’s hard to turn down watching an obscure Argentine film noir! Francis Ford Coppola Imprint Ceremony – If I get in this will be my fourth hand and footprint ceremony. 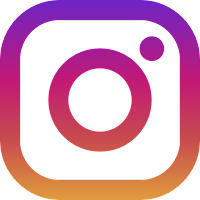 These are so much fun and you feel like you are part of history in the making. From Headlines to Ticket Lines: Journalism on the Big Screen – I’m from the Boston area so a chance to see Ben Bradlee Jr. and Spotlight (2015) screenwriter Josh Singer discuss journalism on film along with James Vanderbilt of Truth (2015) and journalist Mary Mapes is too good to pass up. Mark Vieira signing Into The Dark: The Hidden World of Film Noir, 1941-1950 – One of the perks of TCMFF is the exclusive book signings. This one is at the top of my list to attend. Tea and Sympathy (1956) – Darryl Hickman has been on my wishlist for TCMFF special guests for a long time. He’s been at the festival before but not one I’ve attended. I can’t pass down the opportunity to see him in person when he presents his film Tea and Sympathy. Two Pre-Codes – I’m glad I’ll be able to fit in two films from my favorite decade the 1930s. Pleasure Cruise (1933) and 6 Hours to Live (1932) are showing back to back and they are short enough that I can fit both screenings in before the major event of the evening. The Manchurian Candidate (1962) – This might be the most sought after film screening of the festival because living legend Angela Lansbury will be there. I can’t pass up an opportunity to see her and watch this fantastic mind-bending film on the TCL Chinese Theater’s gigantic screen. I'll have a lot of competition though. 90th Anniversary of Vitaphone – Ron Hutchinson, founder of the Vitaphone Project, will be hosting this presentation of the history of Vitaphone complete with Vitaphone shorts. My favorite short of all time The Beau Brummels (1928) with Shaw and Lee will be screened and I’m beside myself with joy. An Afternoon with Carl Reiner/Dead Men Don’t Wear Plaid (1982) – This four part extravaganza is hard to pass up. Not only do you get to see this film at the TCL Chinese Theater there will also be a Carl Reiner tribute video, a conversation with the man himself and a book signing immediately afterwards. 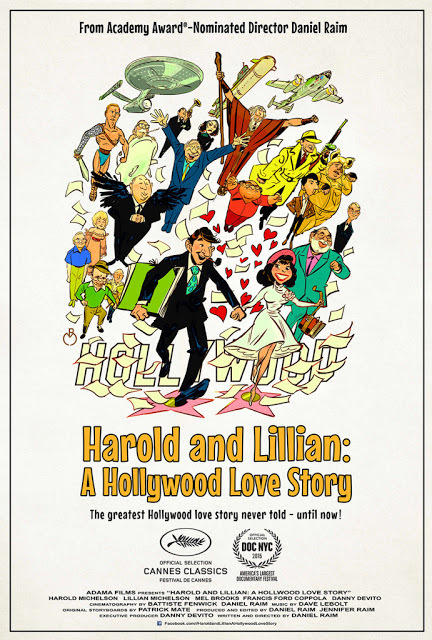 Harold and Lillian : A Hollywood Love Story (2015) – This is my number one pick for the festival. I can’t believe my hero Lillian Michelson will be there along with director Daniel Raim. I had to give up seeing Buona Sera Mrs. Campbell with Gina Lollobrigida to watch this but it’ll be worth it. The Endless Summer (1966) – If you know me you know that I love documentaries and The Endless Summer is one of the most influential documentaries in film history. It’s a stunning color film narrated and directed by Bruce Brown, who will be in attendance, and follows two surfers as they travel the globe searching the best waves. I can’t wait to see the gorgeous colors of this film on the big screen. 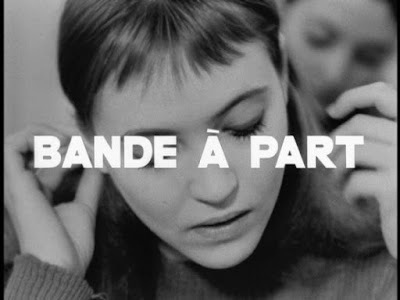 Band of Outsiders (1964) – I dare anyone to stop me from seeing Anna Karina in person. This French New Wave icon will be touring to support the new restoration of this Jean-Luc Godard classic. It’ll be my first time seeing this film and wow what an experience it will be. The Art of the Film Score – I’ll miss the morning screenings but hope to catch this at Club TCM. A Conversation with Gina Lollobrigida - I’m not kidding when I say Gina Lollobrigida is my favorite Italian. Conflicts will take me away from special screenings of Buona Sera Mrs. Campbell and Trapeze but that’s okay because I’m perfectly happy to sit and listen to Lollobrigida talk for a straight hour. This will be glorious! The Russians Are Coming, The Russians Are Coming (1966) – I love madcap comedies and this one looks like a lot of fun. Eva Marie Saint will be on hand to present and maybe Carl Reiner, Walter Mirisch and/or Norman Jewison will surprise us with an appearance? Network (1976) – Unless a TBD calls my name, I’ll be staying around the Egyptian to catch this contemporary classic. I saw Network for the first time last year and loved it. Closing Night Party at Club TCM – This party is always bittersweet and usually I have to leave early. But this time I hope to stay longer for one last hurrah with my friends. 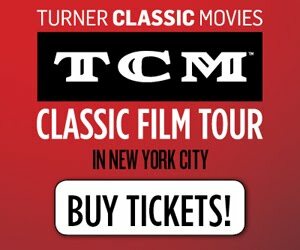 What are your top TCM Classic Film Festival picks? When you find yourself sitting on a gold mine, what do you do? Keep it to yourself? Share it? Lucky for us classic film fans James Bawden and Ron Miller decided to share theirs. 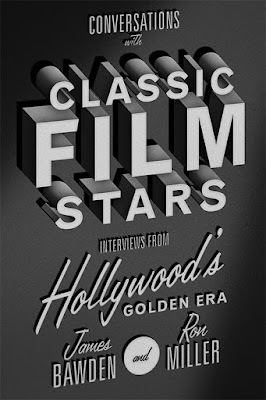 New from one of my favorite publishers The University Press of Kentucky, Conversations with Classic Film Stars is oral history in book form. Within its pages are interviews with 34 of the most beloved stars, collected over a few decades by TV journalists Bawden and Miller. Each interview was conducted face-to-face with the individual and recorded on audio. Some of the interviews were one-time occasions whereas others were composites of several conversations. The interview questions are edited for clarity and continuity but the words themselves are directly from the stars. Each conversation gets its own chapter and includes background on the actor or actress, “setting the scene” which describes how Bawden and Miller came to interview the stars, the Q&A format of the interview plus a couple of black-and-white photos for good measure. Gloria Swanson was a champion for organic foods and loved to push her weird bean sprout diet on other people. Van Johnson was hit by a drunk driver and almost died because police were arguing over the jurisdiction of where the accident took place. A Letter to Three Wives (1949) was supposed to be four wives with Anne Baxter as the fourth. Douglas Fairbanks Jr. avoided doing action films while his father Douglas Fairbanks, whom he affectionately called "Pete", was still alive. Anna Lee referred to Fritz Lang as a "sadist". Glenn Ford got his stage name from Glenford in Quebec, his dad's hometown. His real name was Gwyllyn Ford. Rosalind Russell was MGM's back-up Myrna Loy. Keye Luke started out as a fine artist and helped paint one of the original murals in Grauman's Chinese Theatre. Jane Greer developed Bell's Palsy early on in life. This is why we rarely see her smile in her films. You get a really good sense of the individual’s personalities. Rosalind Russell was fiesty, Van Johnson was very protective of his sexuality, Glenn Ford and Jane Wyman were very fussy, Joan Blondell was as charming as you'd image she'd be and Cary Grant talked about Cary Grant as though he were a separate person. My favorite interview was with Keye Luke, famous for playing Charlie Chan's #1 son. Harold Russell, of The Best Years of Our Lives (1946) fame, had a non-profit organization, Harold Russell Association Inc., which helped the disabled get job training and placement. After some research I discovered that the original office is on my daily commute to work! All of the stars included in the book have passed on (the only exception at the time of this review is Kirk Douglas). There are several recurring themes I've noticed. Because many of the stars were interviewed later in their lives there is a lot of discussion about their TV work in addition to their film career. Most of the stars equated billing in film credits with their current level of success. There is plenty of information about what it was like behind-the-scenes, working with other actors and the challenges of the studio system. For those of you classic film fans who hail from Canada, many of the interviews took place in Toronto! I spotted some errors in the book. For example in Jane Wyman’s interview, a publicity photo of her with Ronald Reagan in Brother Rat and a Baby (1940). It incorrectly lists them as the parents in the film when it was really Eddie Albert and Jane Bryan. In the same interview the authors claim that Wyman is the only “movie actress” ever to be married to a president not realizing that Nancy Reagan was also a movie actress. In the intro to Gloria Swanson’s interview, the authors explain why she never married Joseph Kennedy. I don’t think the authors are giving the reader much credit here. We know why! I found the simplicity of the text and the assumption about the reader a bit frustrating but the quality of the content makes up for this. Conversations with Classic Film Stars was a quick enjoyable read. This book is perfect for someone who doesn’t want to invest their time in full-scale biographies but still wants to learn something new and interesting about their favorite stars. And if you’re like me and just devoured a 900 page biography, a compilation of short interviews makes for a great palate cleanser. 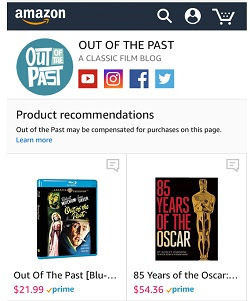 Conversations with Classic Film Stars would make a great gift for someone who is just starting to develop a love for old Hollywood or for someone who has had a life long passion for classic movies. Thank you so much to The University Press of Kentucky for sending me this book for review! French New Wave legend, Jean-Luc Godard muse, style icon and all around goddess Anna Karina is making a rare visit to the United States. She’ll be in California and New York to promote the US premiere and theatrical release of a new restoration of Band of Outsiders (1964). This film is one of several collaborations between Karina and her ex-husband director Jean-Luc Godard which also include A Woman is a Woman (1961), Vivre Sa Vie (1962), Le Petit Soldat (1963), Pierrot Le Fou (1965), Alphaville (1965) and Made In USA (1966). If you’ve ever wanted a glimpse at Anna Karina in person, now is the time! I’ll be at the TCM Classic Film Festival and seeing Anna Karina at a screening of Band of Outsiders is very high on my wishlist. I’ll have lots of competition for the coveted seats in the theater but if I make it in I’ll make sure to report back here. Now is your chance to see Anna Karina in person and to watch the new restoration of Band of Outsiders! 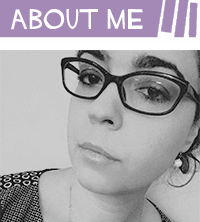 Karina’s tour is funded by Turner Classic Movies, French Cultural Services and Unifrance. The Band of Outsiders was restored by film distributor Rialto Pictures. My father passed away in August and since that time I have been in charge of his settling his affairs. Recently I took a day off to get a few errands done including delivering my parents' tax forms and paperwork to their lawyer. He's been in the business for 52 years and still does everything with pen and paper. When I entered his office I was struck by the lack of technology. He had a simple fold out desk, a basic chair, and paperwork scattered everywhere. There was no computer. He did everything the same way he had been doing it for the last half century. I delivered my parents' paperwork knowing that this is what my father would have wanted. He would have wanted his taxes to be done by the same lawyer who had been doing them for the family since the 1980s. He would have wanted them to be done with pen and paper. He would have wanted a paper check for his tax return. As my father's daughter I saw to it that his final tax forms were done the way he would have wanted because honoring the wishes of the dead is the responsibility of the living. Later that same day I watched the RKO film The Miracle of the Bells (1948). It had been recorded on my DVR in December when TCM had their Frank Sinatra month and I forgot about it. I picked a film at random from my DVR and wouldn't you know it it's a film about carrying out the wishes of someone who has passed away. It's like the universe was waiting for this exact day for me to watch this movie. It's a bizarre little film. Fred MacMurray plays press agent Bill Dunnigan. He brings the body of deceased actress Olga Treskovna (Alida Valli) to her hometown. She left him very specific instructions on what to do after she died. Olga wanted a funeral service held at St. Michael's church, 6 girls dressed as angels surrounding her casket, ringing of church bells and a burial at the top of a hill where her parents were laid to rest. Coaltown is aptly named because of the thriving mining business. The town is also the reason why Olga's parents died and why she died, the coal dust weakened her lungs and tuberculosis set in. Dunnigan's first encounters with the people of Coaltown is disheartening. No one remembers Olga, they speak ill of her father who was known as a town drunk and the funeral director (Harold Vermilyea) wants to squeeze every penny out of Dunnigan. His faith in humanity is restored when he meets Father Paul (Frank Sinatra, yes that Frank Sinatra) of St. Michael's church. Father Paul's humility, patience and willingness to listen allows Dunnigan to open up about Olga's story which the audience see through flashbacks. 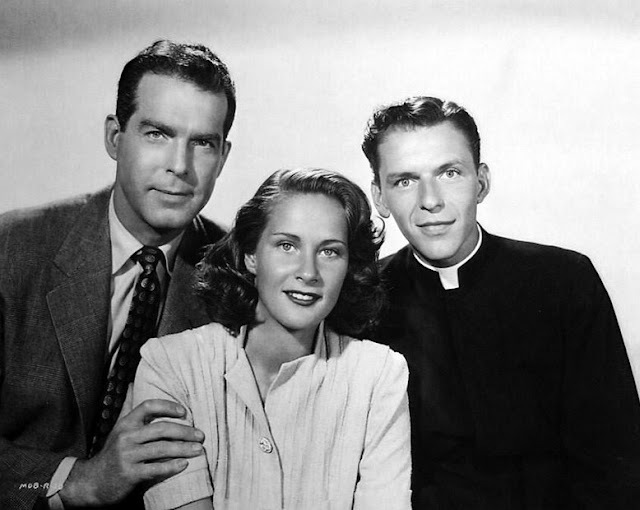 Publicity photo of Fred MacMurray, Alida Valli and Frank Sinatra from The Miracle of the Bells (1948). She's determined to become a star and knows she has very little time to achieve her goal. Dunnigan steps in as her savior in more ways than one. As it turns out Dunnigan has discovered a wonderful new talent in Olga and works to get her the role of Joan of Arc in a film produced by Marcus Harris (Lee J. Cobb). Olga turns out a marvelous performance only to die the day after the film is finished. Harris threatens to shelve the film and reshoot it with another star. Dunnigan is determined to save Olga's legacy. He wants to make her funeral a national story. How does he do it? He pays 5 churches of Coaltown to ring their bells continuously for 72 hours hoping this will bring national attention to Olga and change Harris' mind about shelving the film. In order to make a difference Dunnigan will have to go big or go home. The Miracle of the Bells (1948) might have an odd plot but this quirk film will draw you in and hold your attention. You can't help but root for the main characters even while you're scratching your head with confusion. The first scenes of the film show Dunnigan (MacMurray) bringing Olga's body to Coaltown and this sets a morbid tone to the film. It's not a weepy nor is the film overly sentimental. Which is odd because I think that was the intention in the first place. Because this film is so strange its quirks make it seem more genuine despite of itself. There are religious overtones but it's not heavy handed. Flashback scenes give us plenty of time to learn about Olga and to watch as her relationship with Dunnigan develops. They also give us a respite from the somber tone of the present day's situation. This movie did not fare well despite it being based on the best-selling novel by Russell Janney. It suffered a financial loss at the box office and it was released when Frank Sinatra's career was on a downward spiral. Most people give this film unfavorable reviews however I liked it despite its flaws. Maybe you just have to be in the right mood to enjoy it. 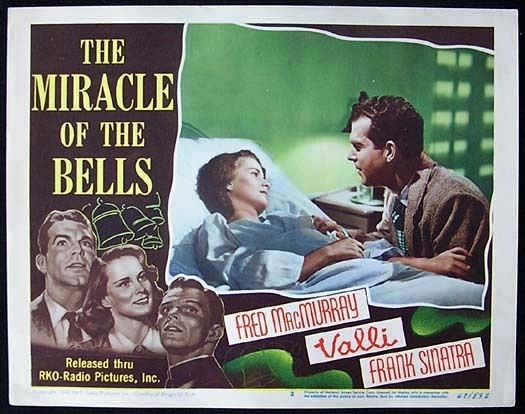 The Miracle of the Bells (1948) is available on DVD and Blu-Ray from Olive Films.